Netflix's new cyberpunk film Mute is unabashedly fond of Blade Runner, but it looks like the director snuck in at least one reference to a more obscure cyberpunk property as well: Syndicate. Not the FPS Syndicate reboot from 2012, the 1993 original from Bullfrog Productions. The critical response to Mute has been mixed so far but you can't argue with Duncan Jones' chops as an old-school strategy game fan. Minor spoiler warning for Mute if you're sensitive to plot details, though this scene gives little away by itself. Sadly I must report that main character Leo doesn't come into possession of a Persuadertron and recruit an entire crowd of unwitting bystanders to his cause. This Easter egg's almost as good though. Fast forward to about 52:30 into the film and you'll join Leo at a futuristic barbecue, trying to get some information from Nicky the pimp. 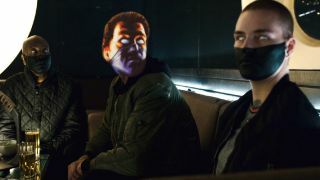 Leo's questions make Nicky antsy, and he informs Leo that the trio of milky-eyed, face-painted cyborgs behind him are a "Syndicate" who work for his boss. One false move, et cetera, et cetera. This is what they look like. And this is what the mind-controlled cyborg thugs from Syndicate look like, at least on the box art (in the game they're about 20 pixels tall). Same name, same eyes, and a similar looking skin-tight black mask. That's way too much to be a coincidence. The link's even stronger when you account for the fact that Duncan Jones plays tons of video games (which is why he directed the Warcraft movie, bless it) and he would have been about 22 - prime strategy computer game age - when the original Syndicate came out. It's always good to see new punks paying their respects to those who have punked before. For more sly cinematic references, read through our list of the best movie Easter eggs. Want more? Check out the best movies on Netflix and the best shows on Netflix now.